Carrying around 350, 000 passengers every year, the North Yorkshire Moors Railway could lay claim to being the busiest steam heritage line in the world. The Whitby-Pickering line was deemed uneconomic in Dr Beeching's infamous report and duly closed in 1965. Happily, the NYMR Preservation Society was formed two years later, reopening the line in 1973 as the North Yorkshire Moors Railway. NYMR steam trains run along BR metals into Whitby station, which still retains its impressive facade. The station was fortunate to survive the 1963 Beeching Report that recommended closure of all three lines that still served Whitby (the fourth line going north up the coast had already gone five years previously in 1958). 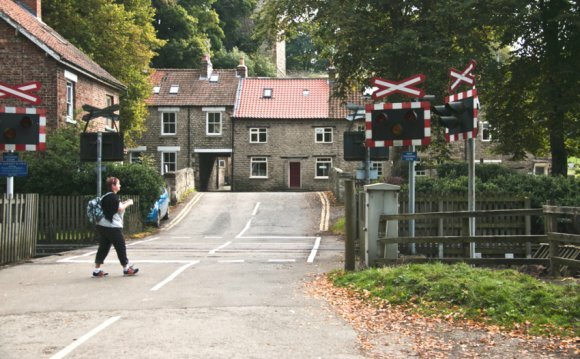 It may seem strange that Whitby's 'main line', the largely double track line to Pickering, Malton with connections to York was not the one to survive but the saviour of the Esk Valley Line was the steep and narrow roads to the villages that it served, making replacement bus services impractical, especially for bringing school children to and from school in Whitby. Tiled map showing the once-extensive railway network around Whitby. Whitby station suffered huge rationalisation over the years with its once bustling goods yard torn up, the signal box demolished, the overall roof removed and platforms 3 and 4 disappearing under the site of a supermarket. All that remains now is a truncated, trackless platform 2, with platform 1 containing the sole running line. Whitby station and goods yard in the 60s. Battling with the map as we plan walks ahead. Steaming into Grosmont station, the first on the NYMR line. The station has been restored to the British Railways style circa 1952 with an adjacent engine shed offering water, coal and maintenance facilities. The station has four platforms - one on the Network Rail line to Whitby, and three used by the NYMR. With its three platforms, level crossing, stock movements, shunting and nearby engine shed, Grosmont really captures the excitement of railway stations in the 40s and 50s. I can almost see the appeal of trainspotting in a location like this. The line plunges into a tunnel as it leaves Grosmont. Entering Goathland, a typical countryside station almost unchanged since being built in 1865. The station attracts tourists a-plenty thanks to its appearances in Yorkshire TV's Heartbeat and the first of the Harry Potter films. The station also has a traditional camping coach, which is let for holidays. Not quite sure what this 'prize length' thing is all about. It sounds a bit phowwaor/ooo-er to me! Through the moors towards Levisham (which some of the Londoners on the trip immediately renamed, 'Lewisham'!). The station also has a traditional camping coach, and you can visit the North Yorkshire Moors Railway's Artist in Residence Christopher Ware in his studio inside the station house. Signal box and crossing gates, Levisham. Auld fella waits for the train. Red phone box on an island lake. Odd. Into the terminus at Pickering. The station serves the busy market town of Pickering and has been restored to its 1937 condition, with original fixtures and fittings in the Booking Office, Parcels Office and Tea Room.